Please note, the current kernel for Ubuntu 16.04 contains only a Meltdown fix, and not one for Spectre. We performed the validation with the https://github.com/speed47/spectre-meltdown-checker tool. The database size is 100GB in a sysbench workload with 100 tables, 4mln rows each with Pareto distribution. We have used a socket connection and TCP host connection to measure a possible overhead from the TCP network connection. We also perform read-write and read-only benchmarks. 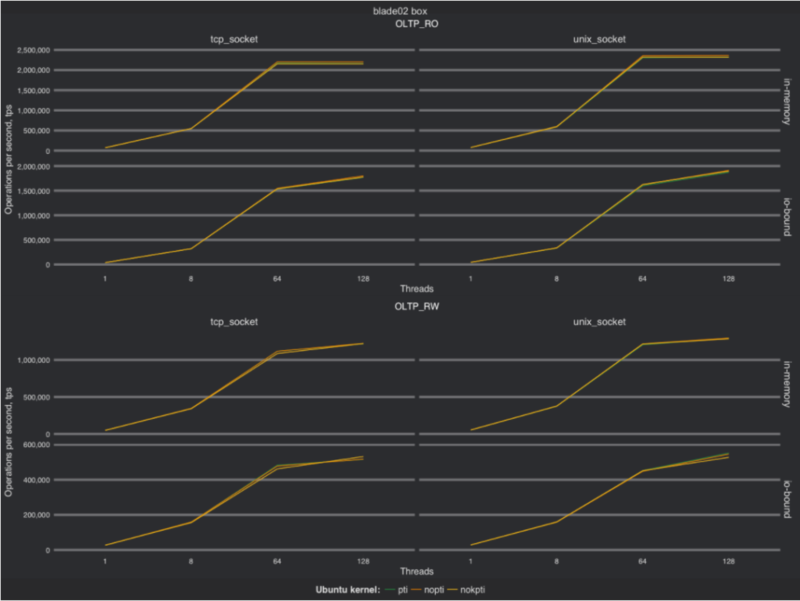 As you can see, there is very little difference between runs (in 3-4% range), which fits into variance during the test. There also we see a negligible difference that fits into measurement variance. To understand why we do not see much effect in MySQL (InnoDB workloads), let’s take a look where we expect to see the overhead from the proposed fix. The main overhead is expected from a system call, so let’s test syscall execution on the kernel before the fix and after the fix (thanks for Alexey Kopytov for an idea how to test it with sysbench). Basically, we measure the time for executing 10000 system calls (this will be one event). This means that time to execute 10000 system calls increased from 2.197ms to 4ms. While this increase looks significant, it does not have much effect on MySQL (InnoDB engine). In MySQL, you can expect most system calls done for IO or network communication. We can assume that the time to execute 10000 IO events on the fast storage takes 1000ms, so adding an extra 2ms for the system calls corresponds to adding 0.2% in overhead (which is practically invisible in MySQL workloads). I expect the effect will be much more visible if we work with MyISAM tables cached in OS memory. In this case, the syscall overhead would be much more visible when accessing data in memory. From our results, we do not see a measurable effect from KPTI patches (to mitigate the Meltdown vulnerability) running on bare metal servers with Ubuntu 16.04 and 4.13 kernel series. what about spectre? Spectre is the one makes it hit hard. At this time there is NO Spectre fixes available for Ubuntu, despite wide range of confusing claims you may find in Internet. We are looking if we can get data for CentOS, but most our bare metal servers are running Ubuntu. Your configuration has a double max_connections parameter and why You use performance-schema-instrument=’wait/synch/%=ON’ when You have performance_schema=OFF ?